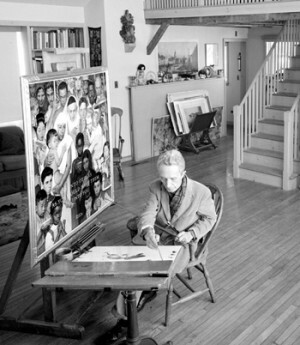 During his career, Norman Rockwell occupied approximately twenty studios, and each of them was arranged in a similar manner. Unlike the stereotypical disheveled artist’s studio, Rockwell’s were always neat and organized. His creativity and prolific production seemed to depend on a physical environment of tidy organization. This installation of the workspace that Rockwell considered his “best studio yet” invites viewers to enter into a day in his profoundly busy work life, and to ponder the aesthetic and practical concerns that informed the artist’s imagery and experience.